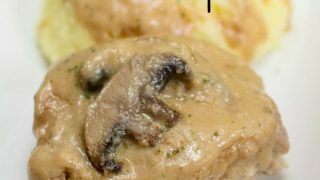 These delicious creamy mushroom pork chops cook low and slow in your crock pot, and come out tender, delicious, and in their very own gravy. Pork chops are such a fun and versatile cut of meat. 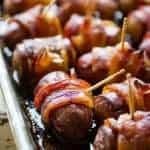 They are wonderful off the grill, pan-fried, breaded, smoked, in the Instant Pot, or in the crockpot. 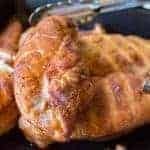 I love this recipe not only because of how easy it is to cook. It also makes its own gravy and is one of the tenderest pieces of pork that I’ve ever had. These pork chops were Jeremiah’s creation this week, and I was so excited about this meal that I took pictures it the day after and bugged him relentlessly until he wrote up the recipe for me. That is not how I usually do things around here. Typically the pictures you see are at least a few weeks old. If there is a couple-day turn-around it is because I am so excited to get it out into the world. Should you brown pork chops before adding to the crockpot? Yessss. All of the yes. The reaction of the meat on the hot pan is something that can’t be replicated with sauces or seasonings. Take the time, get a big hot pan, and sear that stuff! you won’t regret it. 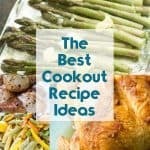 Can I put frozen pork chops in the slow cooker? You can, but I wouldn’t. See the above paragraph. 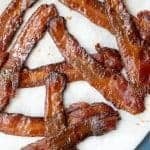 I know it would be easier in some cases, but at least for this recipe – don’t do it! Use fresh or thawed pork chops and make sure to brown them well first. Can you thaw pork chops on the counter? This is one of those food-safety things that you just have to get on board with, even if your mom did thaw things on the counter all your life and you are still alive. Or at least if you do this, don’t feed it to me. 😀 Or the very young or very old. Kthxbai. 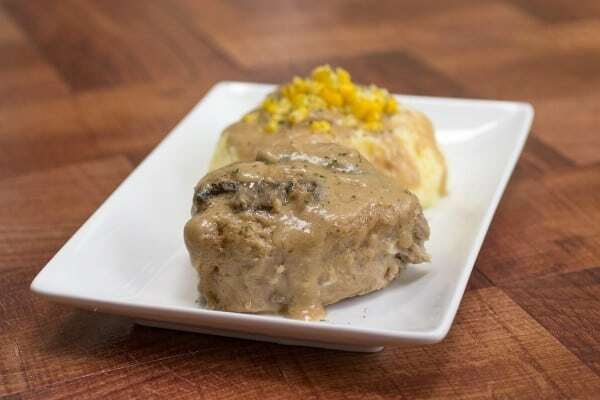 Tender and delicious pork chops make their own gravy. 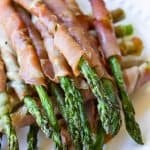 This is one of my favorite comfort foods during the cooler months! Mix 1/4 cup flour with 1 stick of butter into a sauté pan and make a roux. Heat should be on medium low for about 20 minutes, or until the roux is golden brown. Stir constantly or the mixture will burn. Mix 1/4 cup of the flour with the rest of the dry ingredients. Coat the pork chops and brown them in a saute pan with 1/2 a stick of butter. Remove pork chops and place them in a crock pot. Add 1/2 stick butter to the saute pan and add 2 cups mushrooms. Saute’ mushrooms until tender and add to the crock pot. Deglaze pan with two cups white wine. Add 2 cups stock and 2 cups cream to the pan and bring to a simmer while stirring. Add in the roux. Keep stirring until it thickens, the pour over the pork chops in the crock pot. Turn crock pot on high, cover and let cook 4-5 hours. Chops should be fork tender when finished. Yum!! 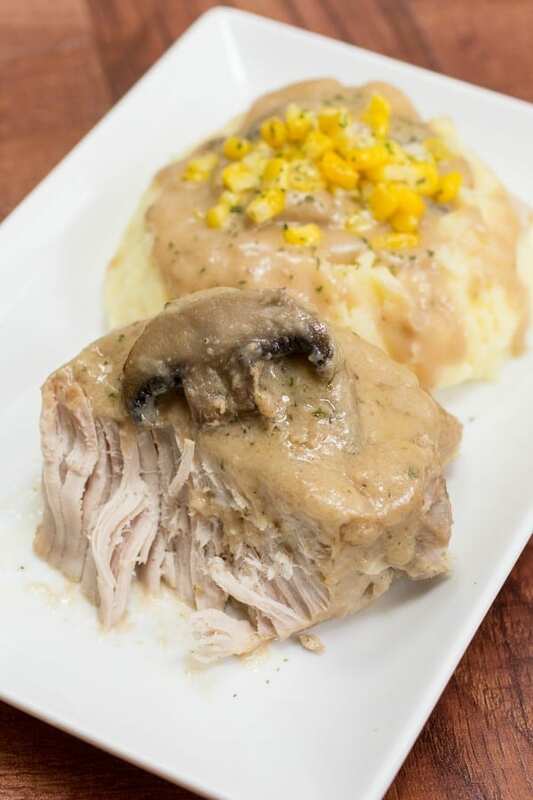 We have a pork chop with mushroom gravy recipe that we love but it isn’t a slow cooker version! I can’t wait to try this! This looks like pure comfort food to me! Love the sauce!! Thanks, Sheena! We loved it too! Great comfort food!!! Would be definitely be perfect for our winter days! Thanks, Deb! I think so too! 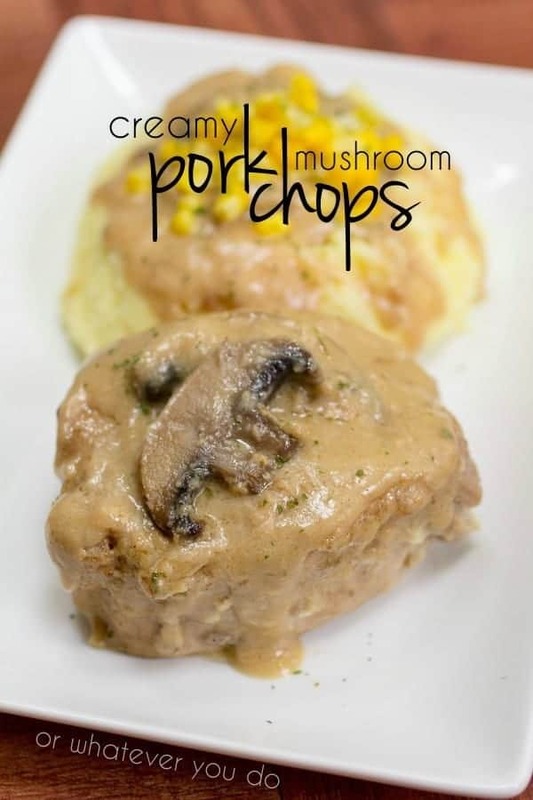 My husband has been asking me to make him pork chops for… a long time! 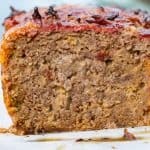 I like the looks of this recipe, yum!! Just ask me how much I love pork chops! I am a huge pork chop fan, and these are making me hungry! 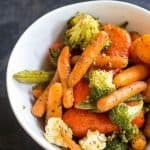 This sounds like the perfect dinner for a busy night, I can’t get enough slow cooker ideas. The sauce on the pork chops looks wonderful! Thanks, Sherri! This one would be perfect for the new casserole crock pot too. I have been loving mine! Yep! Your husband is a keeper! Your hubby has good taste! This sounds fantastic! This looks awesome! Thanks for sharing this my family would love this! My pleasure, Robin! Thanks for stopping by! Tried this recipe last night. I will admit to cutting back on the butter – I probably used 1.25-1.4 sticks, rather than the full 2 sticks. I also used baby portobella mushrooms. I tasted the sauce before I poured it over the pork chops and was concerned at the strong wine taste, but when we ate them, the wine was a very subtle flavor addition – not overpowering at all. I would suggest, however, that you add about 5-10 minutes cooking time to that step, though, for dummies like me that don’t know you need to cook it a bit. 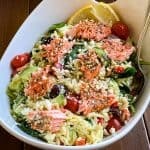 Although this recipe involved a great deal more prep work than most crock pot meals, it is definitely a keeper! Thanks so much for taking the time to review this, Mary! I LOVE it when people report back to me how their dinners went. I’m so glad you guys enjoyed this. I don’t blame you for cutting down on the butter. I probably would’ve too, if I had made it, but this is a Jeremiah special – and he loves his butter! Can the pork chops cook double that amount of time? I’ve never tried cooking them that long, so I can’t say for sure either way. Let me know if you try it though, and I’ll update the post! I went to the grocery store and got the ingredients. Having family over tomorrow. About how many servings does this recipe make? If I were to prep everything and refrigerate it over night so I can start it early in the morning do you think I’ll loose quality in the meat and sauce? I usually make a more easier slow cooker pork chop with campbells soup and onions but since I’ll be feeding more mouths I thought I’d do an extra special mushroom sauce! Thanks for the recipe. It should serve about 8 people, depending on the portion sizes. Hope it is awesome!